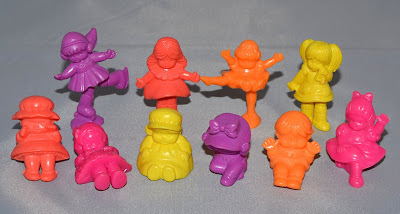 Little Weirdos: Mini figures and other monster toys: C.U.T.I.E. Trendy girls, punk rockers...K.D. Lang? What: Quite possibly the girliest mini figure line in existence. CUTIE ("Coolest Ultra Tiny Individuals on Earth") were the female counterpart to MUSCLE, presumably marketed to girls following MUSCLE's success as boys' toys. 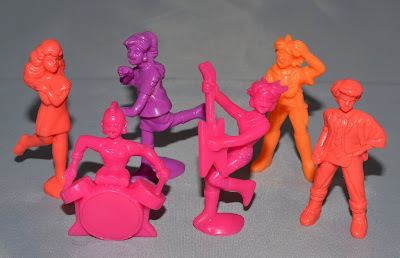 Personally, I think it'd be a lot cooler if there were just some badass female MUSCLEs, but at least CUTIEs had some girl punk rockers (which I find to be the most interesting sculpts). The figures consisted of both grown-up girls and babies/toddlers in various poses and outfits. Where: U.S. (at least). Sold at toy stores, department stores, etc. Well, in my opinion the collections - in general - lack female characters. There should be more girls! Seems some exception are Oritet sets- there is a female in Goblins set, possibly a female in Khitrovany set, PLUS two 100% female sets: Amazon Warriors and Post-apocalyptic Amazons, which are KICKASS!